One of the most thrilling finishes at the Vancouver 2010 Olympic Winter Games resulted in a tale of national pride and Olympic redemption. Maëlle Ricker, competing in snowboard cross only a few kilometers from where she grew up, became the first Canadian woman ever to win an Olympic gold medal in her homeland. OMEGA, the Official Timekeeper of the Olympic Winter Games, presented Ricker with a Seamaster Planet Ocean wristwatch in celebration of her accomplishment. She joined OMEGA president Stephen Urquhart and NASA astronauts and OMEGA brand ambassadors Gene Cernan and Tom Stafford in the brand’s lounge at the Fairmont Hotel Vancouver where the presentation of the watch took place. 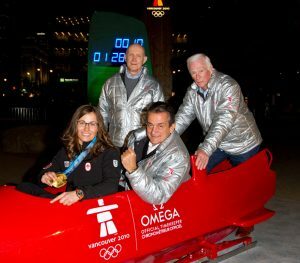 They then crossed the street to pose for photographers in OMEGA‘s red bobsleigh in front of the Official Countdown Clock in downtown Vancouver. When Maëlle Ricker participated in snowboard cross at the Turin 2006 Olympic Winter Games her hopes for a medal were dashed by a fall which resulted in a concussion. She has said that Turin served as a motivation to work particularly hard in preparation for the Games in Vancouver. Ricker is an established star in her sport. She has 23 World Cup medals in snowboard cross, including 12 victories. She has been to the podium seven times in World Cup halfpipe competition and has claimed two gold medals. OMEGA’s famous logo is a familiar site in Vancouver and Whistler and on television screens around the world. The brand’s association with the Olympic Games dates back to 1932 in Los Angeles. That year, OMEGA became the first company ever to be entrusted with the timekeeping at every Olympic event. 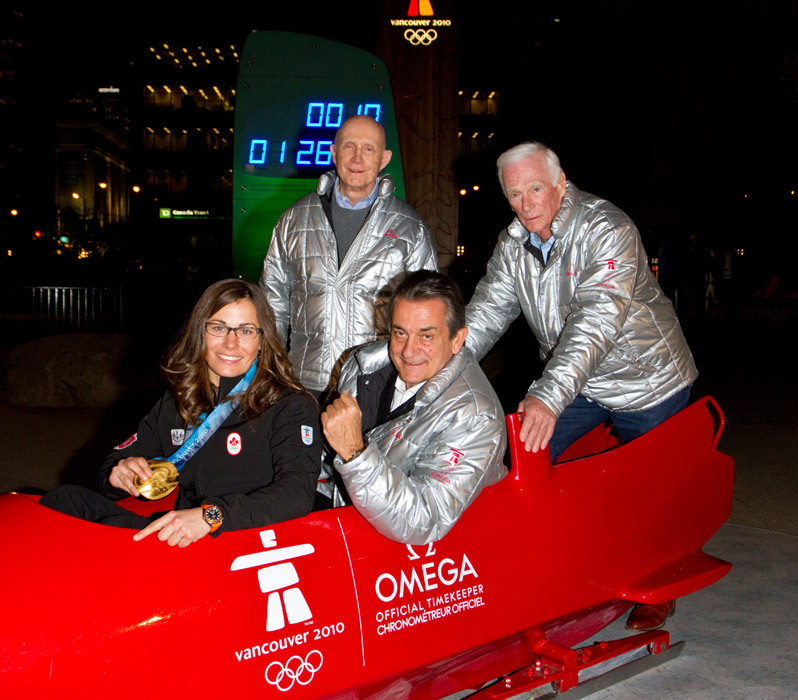 The 2010 Vancouver Olympic Games are the 24th at which OMEGA has been Official Timekeeper. The IOC and the Swiss watchmaker recently extended their agreement through 2020.